Pokemon Battle Revolution (PBR) was released on June 25, 2007 in North America, with a MSRP of $49.99. Pokemon Battle Revolution was the very first Wii game to have online multi-player, as well as connectivity with some of the Pokemon Nintendo DS games. Pokemon Battle Revolution was rated "E" for Everyone by the ESRB, with "Mild Fantasy Violence" as the only content listed for parents to be aware of. How many hours have Wii owners spent battling in Pokemon Battle Revolution? Let's take a look! Pokemon Battle Revolution has 441,681 Wii owners reporting their play-time data through the Wii's Nintendo Channel, with 1,366 days reported. 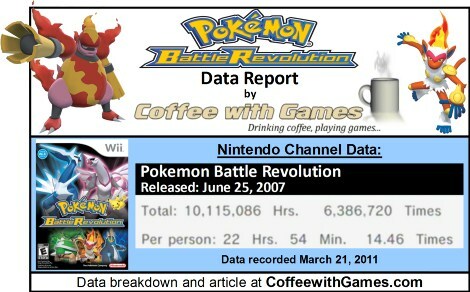 Pokemon Battle Revolution has 10,115,086 Total Hours of game-play reported, with an average play-time of 22 Hours 54 Minutes "Per person" reporting data. Pokemon Battle Revolution's average play-time per session is just over 1 Hour 35 Minutes. Pokemon Battle Revolution's Amazon.com sale rank is #2,162, and it's currently selling for $59.34. Pokemon Battle Revolution's "professional" review score average is 53.19%, based on 34 reviews on GameRankings.com. PBR has a 3.5 out of 5 Stars rating on Amazon.com, based on 43 customer reviews. Pokemon Battle Revolution's customer review score average is 65.11%, when converted to a 100% review scale. I haven't played Pokemon Battle Revolution, but I haven't played any Pokemon game really. The Pokemon series of games is one that I just have never really tried, due to a very shallow hatred for the series I created, dating back to the 90s and the N64 era. I do think the "Total Hours" reported for Pokemon Battle Revolution are low compared to some other Wii games (Call of Duty: World at War, Metroid Prime 3), especially considering it was the very first Wii game to have an online multiplayer aspect. I've read that the handheld Pokemon games, such as Pokemon Black/White , are more popular than the console Pokemon games, and perhaps this data reflects that with the average hours "Per person" reported being just over 20 hours? As for the game's Amazon.com sale rank, I think the Amazon data probably means that Nintendo has stopped publishing Pokemon Battle Revolution, because the game isn't listed from Amazon.com directly, but only from third parties. Have any of you played Pokemon Battle Revolution, and if so, what do you think about the game? Was the online multi-player done pretty well for a Pokemon game? Also, are any of you perhaps still playing Pokemon Battle Revolution on a regular basis? Hey - good article, interesting timing w/ my son's article posting. Like you, I haven't had any play on this series, and Revolution is one of the few Pokemon games not to make it into our house. The only one we picked up for the Wii was Rumble awhile ago. Chris was sitting here and I asked him when he last played it - he says it's probably been about a year. I asked him how he thought it compared to the handheld versions and he says that it wasn't nearly as fun. I think there's more of an rpg/collectible element to the DS ones. "Hey - good article, interesting timing w/ my son's article posting." I literally LOLed last night when I saw your son's review, because of the irony. I usually record all the data stories for the week(and many more) on Mondays, and then pace them out throughout the week. While watching our son last night, I was using my wife's laptop downloaded the Pokemon images for it...then I put him to bed, came back to my PC, and saw your son's review up. I haven't played any of the Pokemon series before. Are they addicting? @coffee - that is pretty amazing timing. And Chris even asked me which game he should review. I was like: Well, Pokemon's the newest one you've been playing, I know you've played it a ton, why not that one? That said, they're not just kid-specific. I run an online game and three of my players were talking about the latest Pokemon White game on there, and all 3 of them are in their 20's, and that conversation must have gone on at least 45 minutes. playing video game cards with coffee is one of my most lovable activity.